We’ve mentioned this project before on here, and now we finally have a trailer. So you remember in the ‘Jackass‘ films where Johnny Knoxville gets done up in Hollywood makeup to look like an old man? He goes around falling over objects in funny places or pretends to steal items from stores as this old man? Well that character’s name was Irving Zisman and he has a movie all to himself. I’m sure we will get another ‘Jackass‘ movie in the future, but with the death of fan favorite Ryan Dunn and the guys being in their 40s now, I’m sure they aren’t to keen on wreaking havoc on their bodies for another brutal, yet hilarious ‘Jackass‘ film. Well, I think this is the next best thing. The film looks like part narrative, part ‘Jackass‘ style, meaning it looks like there is an overall story to the film where Irving is taking his grandson on a roadtrip to see his dad. But along the way, they do pranks and stunts to real people with real reactions. I’ll admit, I laughed out loud several times during this trailer. 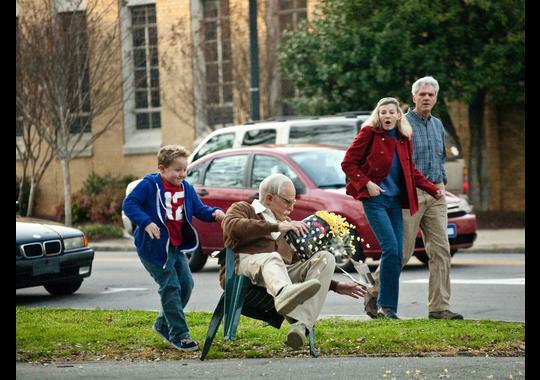 The film comes out October 25th and is called ‘Bad Grandpa‘. I hope the ‘Bad Santa’ people don’t sue and I’m sure we will see some ‘Jackass’ stars make cameos in this. I expect a red-band trailer soon. This entry was posted on Thursday, August 1st, 2013 at 8:52 am	and is filed under Film, News. You can follow any responses to this entry through the RSS 2.0 feed. You can skip to the end and leave a response. Pinging is currently not allowed. « Film Review: ‘Smurfs 2’! !